Try It: 6 Fantastic Ways To Create Perfect Winged Eyeliner! Let’s just all agree that nothing elevates your eye make up game like a perfectly drawn dramatic winged eye-liner. It looks super hot and complements almost every kind of look. With winged liner being the hottest trend you cannot let your shaky hands and lack of proficiency keep you away from achieving this feat. Follow our step by step tutorial to create cat-eyes and wings that are sharp enough to kill. 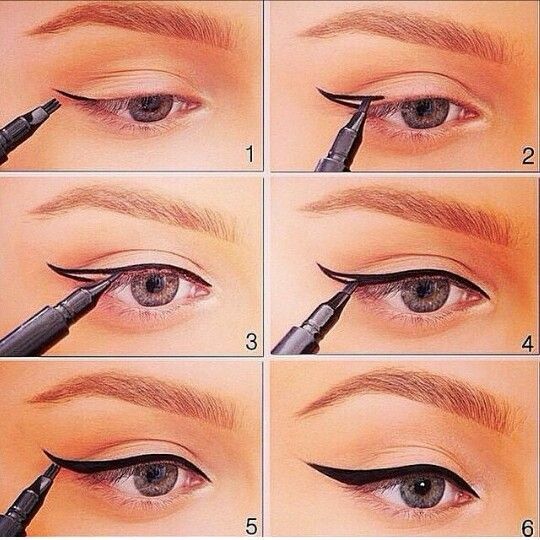 How To Do Winged Eyeliner? 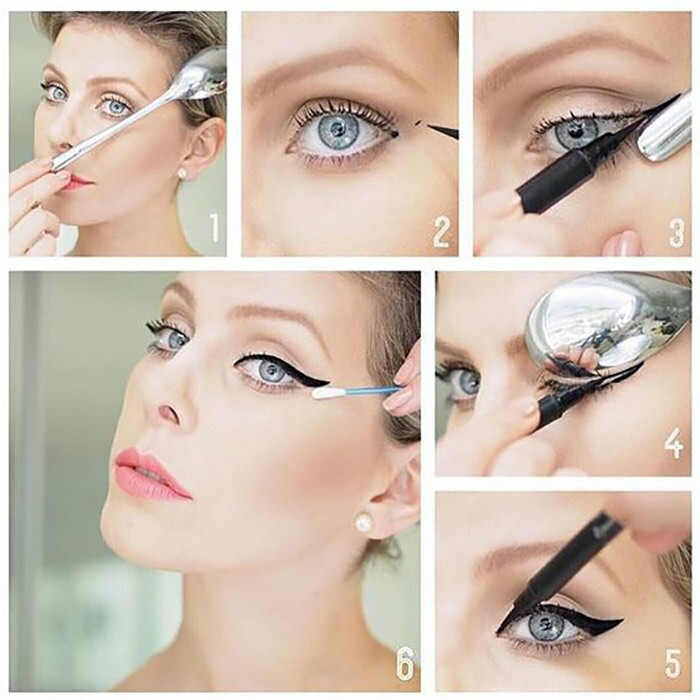 Method 1: How To Create Winged Eyeliner With Angled Eyeliner Brush? This one has been specially designed to help you with your winged eyeliner woes. Honestly speaking, it does not get any easier than this. You can also wet the brush slightly for a super neat result. Fill in the blank space between the lines with your eyeliner brush and extend the liner to the inner corner as you normally do. Yes, it needs some practice and a steady hand, but with a little patience and proper method, it is absolutely achievable to apply perfect and neat winged eye-liner. Now, fill up the gap until no skin peeps through from between the upper and the bottom line that forms your wing. If you are ok with a softer finish, leave it as it is. 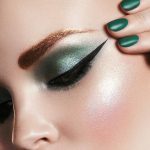 But if you want your wings to be more striking and bold, take a liquid eyeliner and carefully trace along the lines you have created with your pencil eyeliner. Also, if you are planning to include this step, you can allow your lines to be a little rough on the edge while using the pencil eyeliner. The liquid eyeliner will cover up the rough edges to give a perfectly smooth finish. Quick Note: When applying eyeliner with a free hand, make sure to rest your elbows on a flat and steady surface. This will give a good amount of control over your hand movements. If this guide doesn’t do the job for you, then you probably require some additional help to master those killer wings. Fret not. Your solution lies in everyday items like spoon, scotch tapes or brushes specifically meant for the purpose. Check out the following hacks and find out how you can create dramatic winged eyeliner with the right items. 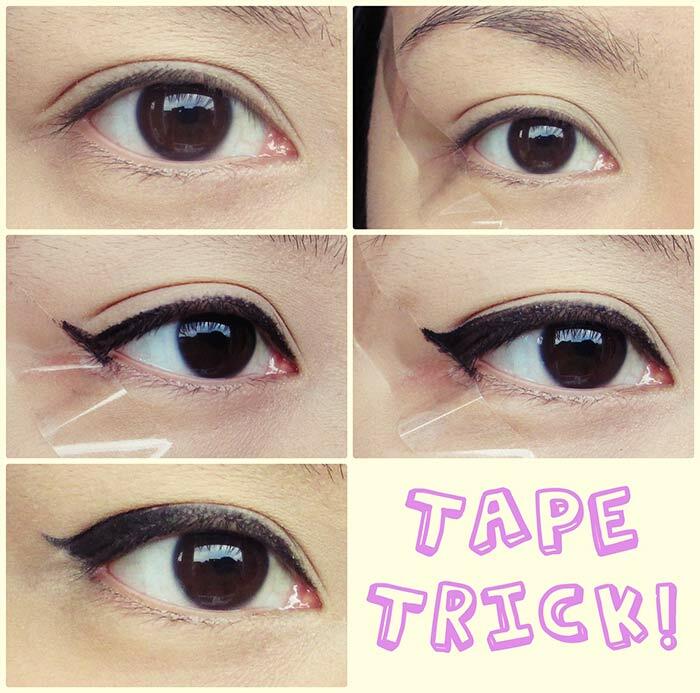 Method 3: How To Do Winged Eyeliner With Tape? 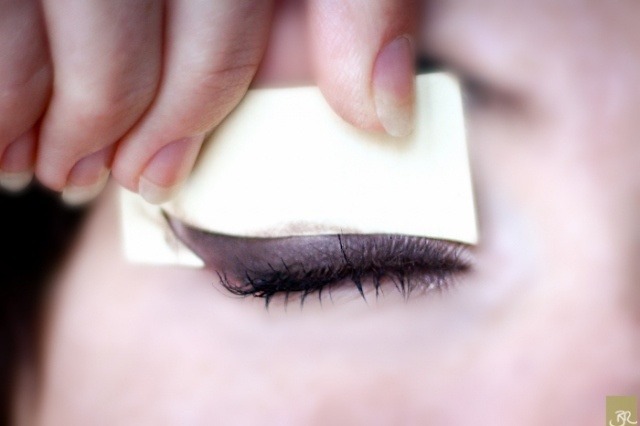 Cut a tape measuring about 2 cm and stick along the outer edge of your eyes in an angle you would want your wings to be. 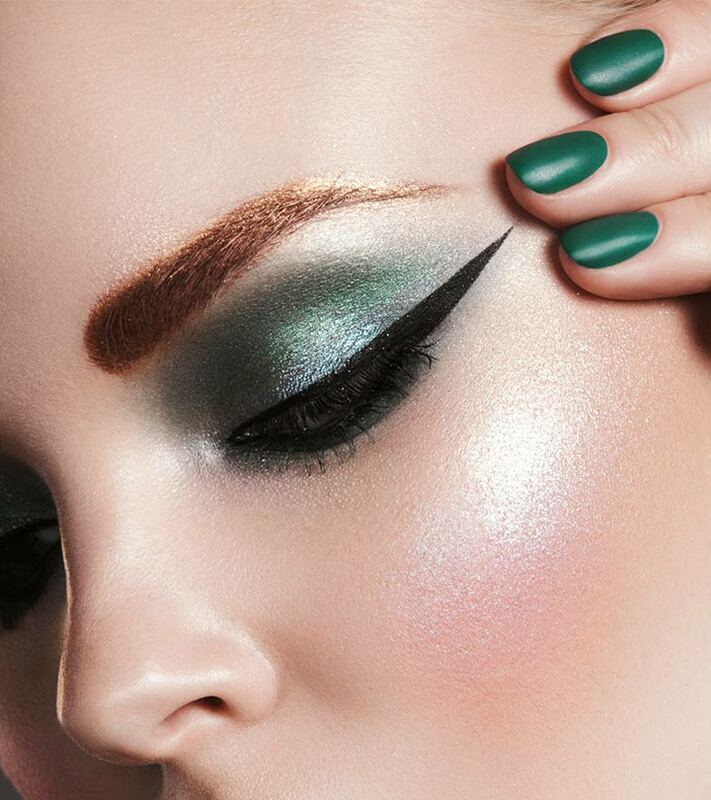 Trace along the angled edge with your eyeliner to draw the wing using the outlines of the tape as guidance. Finish off by extending the line along your upper lash line. Method 4: How To Create Perfect Winged Eyeliner With Spoon? Head to your kitchen and pick up a spoon to give you the perfect winged eyeliner you always desired. The straight edge of the handle and the curve of the spoon is a perfect tool to guide for neat and precise wings. Hold the handle of the spoon at the outer corner of your eye. 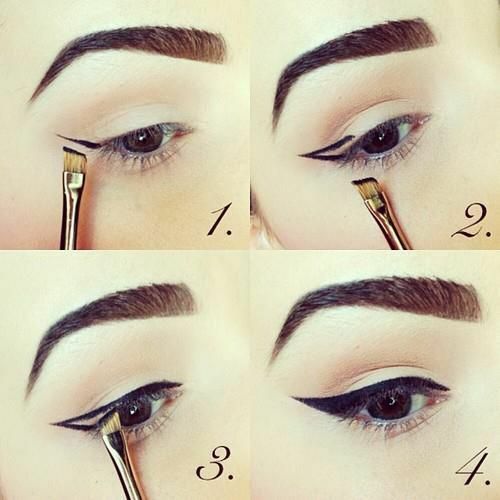 Draw a straight line with your eyeliner following the line of the handle. Now, place the rounded portion of the spoon and cup your eyelids. Use the rounded edge to create the curvy tip of your wing. Fill in the space between two lines with eyeliner and extend the liner onto your upper lash line like you normally do. Method 5: How To Create A Perfect Winged Eyeliner With Business Card? 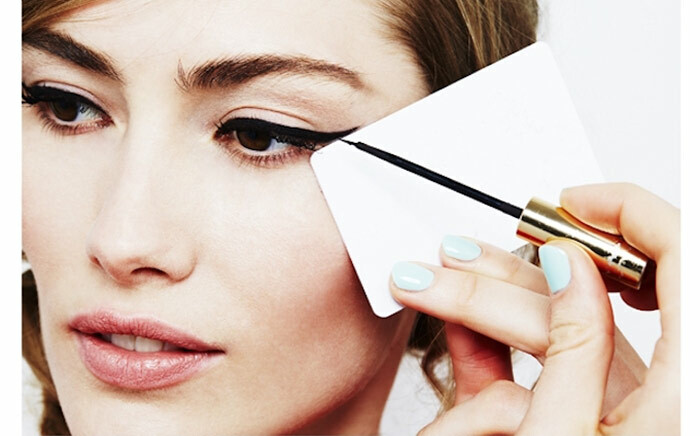 Your solution to expertly draw winged eyeliners is probably sitting in your purse. Just fish out a business card you no longer have any use of, and make your personal winged eyeliner stencil. Use your credit or debit card for helping you draw your winged eyeliner, instead of paying to buy expensive stencils and tools for achieving neat wings with your eyeliners. Hold the straight edge of the card at the outer corner of your eye making a slight oblique with your temples. Trace along the straight edge with eyeliner to create the wings. Extend the eyeliner to the inner corners of your eyes along the upper lash line. P.S. You can also use a pen or a pencil or basically any straight object and follow the same method to achieve a straight wing. However, in these cases, the wing is likely to be sharper and less curvy. Be careful with the choice of your eyeliner type. Eyeliners mainly come in three avatars—liquid, gel and pencil. While liquid and gel liners give a more bold and striking finish, it can be a little messy to work with, especially for beginners. On the other hand, pencils give a softer and subtler finish, it gives you a great control and is thus recommended for beginners. Winged eyeliner and cat-eyes looks super hot on almost everyone and can be worn for any occasion or even on a daily basis. You can, however, play with the length and sharpness of the wings depending on the level of drama you are going for. Also, find out the placement and shape of the wings that complement the shape of your eye, and adjust it accordingly. If you are a beginner, it’s but natural to mess up eyeliners even with all the guidance. Don’t worry if you make a mistake. Dip a cotton swab in petroleum jelly and gently erase the smudge with it. You can also use a clear lipgloss for a quick fix. To have an even better control over liquid eyeliners, toss it in a refrigerator for 10-15 minutes. This will harden the applicator to make it easier to control. So now with all these tips and tricks in your kitty, all that is left to be done is taking your eyeliner and trying out this ultra glam look. Don’t fret if you do not get it in the first go. It takes a little practice and a bit of patience to master the art of eyeliner like a pro. 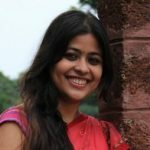 You will definitely get there, till then, use these hacks and keep slaying. Tell us if you have any hacks or tips for perfect winged eyeliners and do let us know if you found this article helpful. How To Wear Pencil Eyeliner Perfectly?